There is a need to identify objective measures for growth in the development of intercultural competence for students who engage in education abroad programs of study. The Intercultural Development Inventory® (IDI) identifies the participant's orientation on the Intercultural Development Continuum™ (IDC). Students completed the IDI 4 weeks prior to departure and 8 weeks upon completion of an education abroad program. Students were debriefed by an IDI-qualified administrator. Group results suggest that students perceived they were further along in the IDC than their actual developmental orientation score revealed. Institutions of higher education are increasingly moving toward internationalization of programs in hopes of preparing students to become global citizens in the current rapidly globalized milieu. Internationalization involves integrating an international/intercultural dimension into the teaching, research, and service functions of the institution (Knight, 1994). Developing intercultural competence is critical if internationalization is to be achieved. Intercultural competence involves “increasing cultural self-awareness, deepening understanding of the experiences, values, perceptions, and behaviors of people from diverse cultural communities, and expanding the capability to shift cultural perspectives and adapt behavior to bridge across cultural differences” (Hammer, 2012, p. 116). The attainment of intercultural competence is a dynamic developmental process that is a necessary attribute for graduates of higher education. As the U.S. population becomes more diverse, an important strategy in reducing health disparities is the development of a workforce and health care system that is more culturally competent. An approach that appreciates the intercultural competence helps address communication barriers with people of limited English proficiency and low health literacy. Improving the nation's workforce by strengthening intercultural competency and increasing diversity are part of the U.S. Health and Human Services (2011) Disparities Action Plan. Previous studies have examined factors influencing the development of cultural competence in undergraduate nursing students (Chen et al., 2018). This research brief presents results of a pilot study conducted to examine intercultural development of nursing students who participated in a college of nursing education abroad program, which included a predeparture course. The Intercultural Development Inventory® (IDI) was used to help students and faculty assess their intercultural competence, achieve increased capability in shifting cultural perspective and adapting behavior across cultural differences, and measure change along the Intercultural Development Continuum™ (IDC), (Hammer, 2011). This instrument was used in the United Kingdom (Lantz-Deaton, 2017) to assess intercultural competence. Findings suggest that through policy and practice change, universities must support development beyond merely offering positive intercultural experiences for students. Subsequently, in the pilot study, the investigators approached the college of nursing leadership team and requested consistent use of a measurement tool to monitor and inform the education abroad curriculum. The IDC describes a set of orientations toward cultural difference and commonality and spans from a monocultural mind-set to an intercultural mindset. Descriptive orientations along the development arc include Denial, Polarization, Minimization, Acceptance, and Adaptation (Hammer, 2012). The IDC Orientation of Denial can be described as little recognition of more complex intercultural differences. The IDC Orientation of Polarization can be described as judgmental orientation—us versus them. The IDC Orientation of Minimization highlights cultural commonality that can mask deeper recognition of cultural differences. The IDC Orientation of Acceptance recognizes cultural commonality and difference in one's own and other cultures. Finally, the IDC Orientation of Adaptation is the ability to shift cultural perspective and adapt behavior to cultural context. Hammer (2011) proposed this continuum based upon Bennett's (1986) Developmental Model of Intercultural Sensitivity and then created a tool, the IDI, for cross-cultural assessment of intercultural competence. The IDI aids in developing intercultural competence through a theory-based, valid and reliable measure of an individual's perceived and actual intercultural competence as defined on a continuum (Hammer, 2011). By providing self-awareness and utilizing the developmental plan in an intentional manner, intercultural development growth can be achieved and one's perceived and actual orientation will move along the continuum toward intercultural competence. The use of the IDI requires a qualified administrator (QA) to facilitate distribution, debrief with the participant, and act as the primary resource for questions participants may have about their intercultural orientation and plan for development. Individuals who wish to become QAs attend the IDI Qualifying Seminar. This in-person, 3-day session includes IDI administration and debriefing, an extensive resource guide, lectures, role-play, and group work. There is a fee for the initial QA training, with qualification maintenance provided without cost. The administration of each IDI is accompanied by a nominal fee. The IDI provides practical, in-depth information and is available in 17 languages. Debriefing by the QA takes place after the individual has had a chance to review their IDI and Intercultural Development Plan® for 24 to 48 hours. Group and/or individual feedback can be provided. The goal for the 30- to 60-minute individual feedback session is to review the IDI profile results and engage in action planning to foster intercultural growth. This growth is indicated by movement along the IDC and can be objectively measured by future IDI results. It is essential that results are not viewed as good or bad; rather, the results provide self- and other awareness of cultural differences in how individuals approach and resolve problems and conflicts (Hammer, 2011). The feedback session provides a structured time for discussion of results and development of an intercultural development plan to foster growth. Ten students participated in the research pilot project, which was offered in an elective education abroad course between February and May 2017. The course had two components: a 7-week predeparture component that used hybrid classroom methods (e.g., asynchronous online and face-to-face class meetings) to deliver content about the geography, culture, language, health care system, health care needs, and health professions; and the in-country component, which was 12 days in Nicaragua. During this portion of the class, students engaged in service-learning for 5 days with a community partner health clinic in Ciudad Sandino, then spent time visiting a pediatric hospital, a nursing school, a traditional coffee cooperative and a farm in a rural area. Service-learning activities included providing health education to pregnant women and new mothers, adults with chronic conditions, and health promoters. Assignments included introducing one another on an online discussion board, creating an education program and delivering it at the service-learning website, keeping a critical incident reflection journal, and writing a blog entry. The study was approved by the institutional review board of The Ohio State University. All participants in the study gave informed consent. A purposeful sample was used consisting of undergraduate students who had completed their sophomore or junior year in a traditional Bachelor of Science in Nursing program and were enrolled in an elective three semester credit-hour education abroad course at The Ohio State University. This opportunity is student funded, with partial scholarships available. Participants ranged in age from 18 to 30 years. Nine females and one male participated. Participation was voluntary and did not affect the students' grade in the education abroad program of study. No incentives were offered to the participants. The IDI assesses intercultural competence, which is defined as the ability to shift cultural perspective and appropriately adapt behavior to cultural differences and commonalities (Hammer, 2015). The IDI is a 50-item questionnaire, available online and in a paper-and-pencil format that can be completed in 15 to 20 minutes. The tool was selected because it is interdisciplinary and can be utilized in a variety of contexts, including individual, group, program evaluation, organization evaluation, and selection processes. The IDI allows the QA to add contexting questions to attain more information about each participant's unique experiences with culture. Participants were invited to complete the IDI in an online format during the spring semester 4 weeks prior to departure (first time) to Nicaragua and 8 weeks after returning from the education abroad program (second time). Participants received a copy of their results via e-mail and then were invited to a debriefing session by a QA to review their results after each time that they completed the instrument. Debriefing is a requirement of the agreement to be a QA of the IDI. The debriefing session occurred in a face-to-face session with each individual participant and a QA. The sessions lasted approximately 30 minutes and provided the participants with an opportunity to review their results and develop a plan to enhance their level of intercultural competence. A customized intercultural plan is generated by the IDI. However, during the debriefing session, participants are encouraged to revise the plan on the basis of their individual goals and interests. Demographic characteristics of the students who completed the pre- and postdeparture IDI are presented in Table 1. Nine of the 10 students (one male, eight females) completed the postdeparture IDI questionnaire. All of the students were nursing majors and between the ages 18 to 30 years. Students were all U.S. citizens and the majority had never lived in another country outside of the United States. The IDI provides valuable feedback regarding participants' placement along the intercultural development continuum. The Perceived Orientation score represents where the group members perceive themselves on the developmental continuum. Members of the group perceived themselves to be in Acceptance pre- and postdeparture. The predeparture Developmental Orientation score, which provides the actual orientation as measured by the tool, indicated the group's primary orientation predeparture was Minimization, reflecting a tendency to highlight commonalities across cultures that can mask important differences in values, perceptions, and behaviors. The group's postdeparture Developmental Orientation score indicated the same orientation (Minimization). The difference between the way participants view themselves and their actual score is measured by a gap score, which if larger than 7 points, is significant. 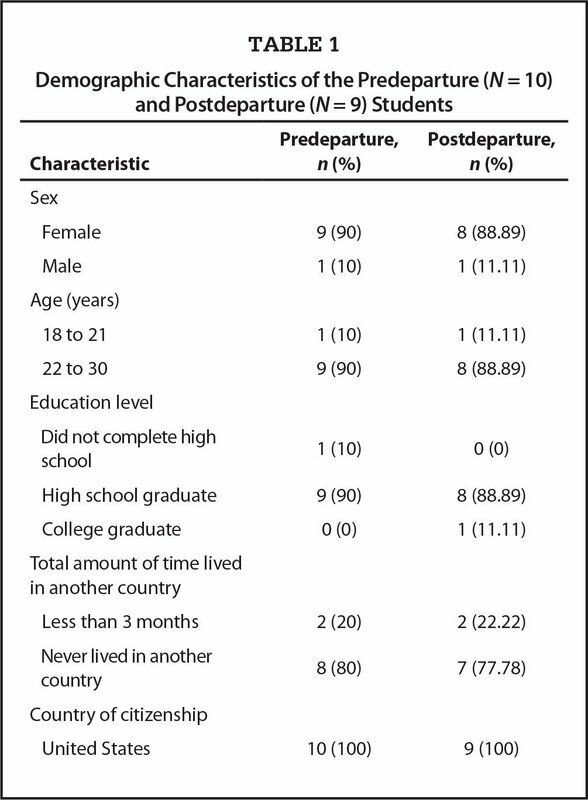 The predeparture and post-departure gap scores were significant, indicating that the students' perception of their individual intercultural orientation overestimated their actual intercultural orientation. The Orientation Gap was narrowing, with a predeparture raw score of 32.21 and a postdeparture gap raw score of 27.66. The Trailing Orientation (TO) indicates whether the person in certain situations, under stress, or around specific topics engages in cultural differences from an earlier orientation on the developmental continuum, rather than their primary orientation. TO data is useful when the QA debriefs with participants. The predeparture TO was 3.22 and the postdeparture TO was 3.60, indicating that some participants were not fully resolved in terms of how connected or disconnected they felt toward a primary cultural community. The Leading Orientation (LO) is the next orientation point on the IDC. For this group, pre- and postdeparture, the LO was Acceptance through Adaptation. I love experiencing new cultures and getting to know new groups of people. Going to Haiti was an amazing experience an [sic] it was so cool to connect with the Haitian people despite the language barrier. I spent 9 days in Haiti stay [sic] on the grounds of a school in Haiti. My biggest challenge would be getting past the language and cultural barrier. When I want to get to know someone but we have trouble communicating, it makes things extremely frustrating for both sides. When I am unfamiliar with their culture, I want to ask questions and understand, but I also do not want to be offensive in any way. The developers of the IDI state that it is common for individuals to overestimate their level of intercultural development. During the debriefing session, individuals are provided an opportunity to reflect upon progress on the IDC and identify strategies for personal development. The Developmental Orientation scores indicate that the students were beginning to gain a more realistic view of their intercultural development orientation after the education abroad experience. It is helpful to explain to participants that it is not unusual to go “one step forward and then two steps backward” or to go “back and forth” in the development of intercultural competence. As the group moves past TOs, then a more consistent sense of progress and shared focus can emerge. Results suggested that the group made progress between pre- and postdeparture and was moving closer to becoming resolved. The group's TO scores pre- and postdeparture suggest that the group was moving forward along the IDC from a monocultural mindset, where students miss differences between cultures, toward an intercultural mindset, where differences are deeply comprehended and bridged. LO scores suggest that as the group began to more fully recognize and appreciate cultural differences, it can look for ways to shift cultural perspective and adapt behavior around cultural differences. Review of contexting questions during the debriefing session are useful to help students identify how past experiences with individuals of other cultures or former coursework may shape or influence their developmental orientation. Limitations of this pilot research study include a small sample size, students self-selected to participate in the nursing education abroad program, and one student did not complete the postdeparture IDI. It is a challenge to keep students engaged after they complete their education abroad experience, thus contributing to fewer students taking the IDI a second time. The results are not generalizable to students outside of this study sample. The IDI has several strengths for use in measuring the intercultural development of students who participate in education abroad programs. The instrument is theory based and has been well studied for reliability and validity across cultures. The IDI can also be used with interprofessional teams of students who include members who are not health science students. Results from the pilot study suggested no need to change the current preparation practice strategies that we used in the predeparture portion of the education abroad course at the present time. However, we are in the first year of a longitudinal study in which all students who participate in any of the Nursing Education Abroad programs will be invited to take the IDI pre- and postdeparture. With an increased sample size and more data, we anticipate using the data to inform and revise the preparation practice strategies if necessary. Students are given the opportunity to reflect and gain self-awareness of their current position on the IDC and progress toward their LO. In addition, students have developed their unique intercultural development plan, which is a tool they can utilize throughout their nursing education and future professional development to continue progress along the IDC. Students from the pilot study gained satisfaction from seeing their progress along the continuum, which, in turn, may inspire them to continue their growth of intercultural competence. Faculty who teach education abroad courses were able to use the information they received to assist them in two ways. First, faculty could gauge the level of intercultural development for each student, as well as for the group as a whole, and plan strategies to foster group cohesion, group communication, and tolerance for students who are at varying levels along the continuum. Furthermore, faculty were able to assist students to find opportunities to work their plan and also create new opportunities to foster intercultural development for students during the Education Abroad experience and also when the students return to campus. Because each faculty member who teaches in the Education Abroad program is also a QA, the faculty members were able to help one another problem solve difficult conversations, address potential areas of conflict, and encourage one another to progress along the IDC. The support of a peer group is helpful as often faculty who teach education abroad programs may feel isolated from other faculty who do not lead such programs. Having an objective measure of students' level of intercultural competence before and after an education abroad program can be useful to measure outcomes and also help college administrators to gauge the return on investment for such programs. Results of the pilot program were shared with the University's Office of International Affairs, which oversees Education Abroad programming across the university. The office expressed interest in learning more about the IDI. Furthermore, several colleges within the university are using the IDI and data can be compared and analyzed as a measure of outcomes. Currently, this college of nursing offers education abroad programs to four international destinations: Nicaragua, Honduras, Ethiopia, and Isle of Jersey, United Kingdom. As a continued effort to track outcomes of students and faculty who participate in education abroad programs, for the next 5 years, all future student participants will be invited to take the IDI pre- and postdeparture to help track the progress of students and resident directors along the IDC. The current resident directors of each program are already QAs and new resident directors will be encouraged to take the training to become QAs. The IDI holds great potential to measure the progress of students and faculty along the intercultural development continuum; to help individuals and groups set goals and make plans to enhance their intercultural development; to use results to revise course content and learning activities in both the predeparture and in-country components of the course; and to design faculty development opportunities to foster the growth of faculty who lead these programs. Hammer, M.R. (2012). The intercultural development inventory: A new frontier in assessment and development of intercultural competence. In Berg, M. Vande, Paige, R.M. & Lou, K.H. (Eds. ), Student learning abroad (pp. 115–136). Sterling, VA: Stylus. Knight, J. (1994). Internationalization: Elements and checkpoints. Ottawa, Canada: Canadian Bureau for International Education. Dr. Fitzgerald is Associate Professor of Clinical Nursing, Dr. Marzalik is Assistant Professor of Clinical Nursing and Director of Nurse-Midwifery and Women's Health Specialties, and Dr. Kue is Assistant Professor of Nursing and Director of the Office of Global Innovations, The Ohio State University College of Nursing, Columbus, Ohio. This research was supported in part by a grant from the Office of Service Learning at The Ohio State University. Address correspondence to Elizabeth A. Fitzgerald, EdD, APRN-CNS, PMHCNS-BC, CTN-B, Associate Professor of Clinical Nursing, The Ohio State University College of Nursing, 356 Newton Hall, 1585 Neil Avenue, Columbus, OH 43210; e-mail: fitzgerald.118@osu.edu.